Rowing on Lake Hoyt in Buffalo’s Olmstead Park is quickly a becoming Father’s Day tradition. 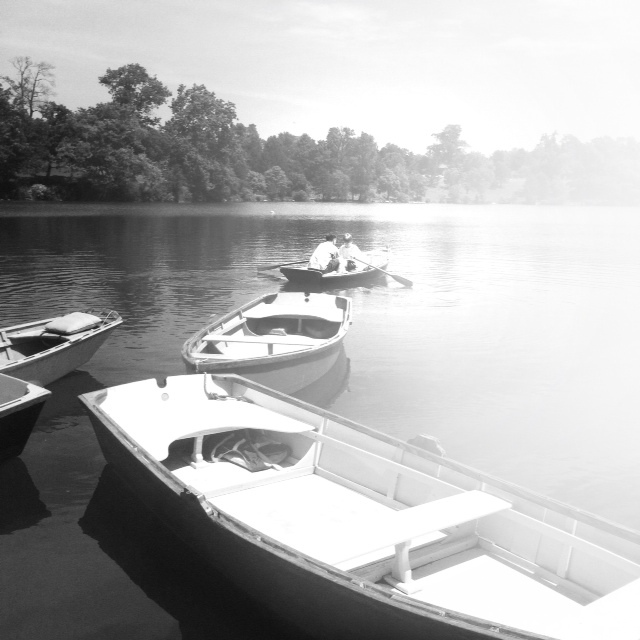 After lying dormant for many years, back in 2008 the boathouse and boats were brought back to life by the Olmstead Park Conservancy. The boats, designed after the original boats from 1868, are painted in bright colors and are really a work of art in themselves. The view of the boathouse, Shakespeare Hill, the rose gardens, art museum, history museum and the Japanese Gardens are stunning. It always seems a bit magical when you can be one on one with nature, while remaining in a city environment. It is truly the best of both worlds. This is a photo of my husband and son about to “set sail”. I know they were both looking forward to some father/son time out on the water, along with my son secretly planning how they would be the first back to the docks, beating my daughter and her friend. Yep, it often turns a bit competitive out there! 😉 None-the-less, it’s always a great time. My kids are blessed with a Dad who wants nothing more than to spend his time with his family, to live life to the fullest with us and to teach by example. I shot this photo with my iphone 4 in 12:00 noon sunshine. I’m always amazed at how well the iphone camera handles the bright sun. For the edit, I was looking for that nostalgic feel of yesteryear, so I knew I wanted to change it to a vintage black and white. I sharpened, cropped, played with saturation, contrast, and brightened in snapseed. I also have to add that I was thrilled to see this morning that this photo was a solo feature on instagram with MomHub. Always an honor and encouraging to have one’s work recognized. If you are on instagram, check out @mom_hub. There community is full of talented and inspirational artists! And… Where is Alex? She and her family have travelled to Europe and the internet is being fickle! 😦 She will hopefully be back on the blog next week with some European “Nature”. See you then, Alex. Happy travels!